Listen and share this podcast. Download 34 Celtic MP3s for Free. Subscribe to the Celtic Music Magazine. This is our free newsletter and your guide to the latest Celtic music and podcast news. Remember to support the artists who support this podcast: buy their CDs, download their MP3s, see their shows, and drop them an email to let them know you heard them on the Irish and Celtic Music Podcast. The Irish & Celtic Music Podcast is supported by listeners like you. Over 200 kind and generous people pledge $1 or more per episode to celebrate Celtic culture through music, each and every week. Your generosity helps pay for the production of the podcast as well as my time in producing it. As the world's largest Celtic podcast, you give these independent bands a fighting chance to be heard by thousands of Celtic music lovers around the world. * Helping you celebrate Celtic culture through music. My name is Marc Gunn. I am a Celtic and Geek musician and podcaster. This show is dedicated to the indie Celtic musicians. I want to ask you to support these artists. Share the show with your friends. And find more episodes at celticmusicpodcast.com. You can also support this podcast on Patreon. I just released a Kickstarter for my third album of Irish Drinking Songs for Cat Lovers. This one is Sea Shanties for Cat Lovers. You'll find a link to it in the shownotes. Kerrydan tweeted a picture: "Hi Marc! 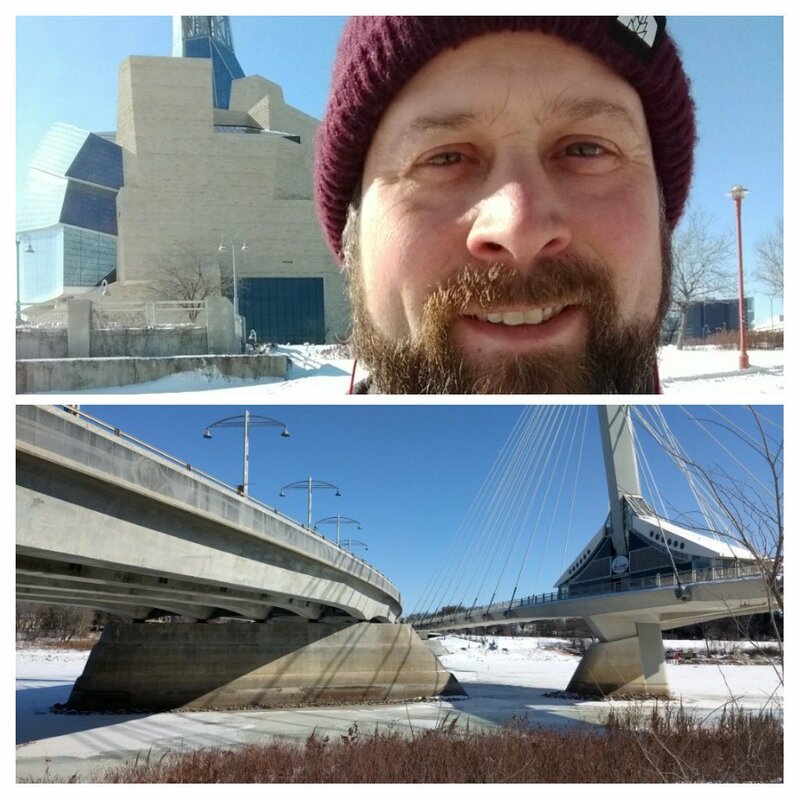 Really loved listening to this instrumental show on my brisk lunchtime walk along the Red River in Winnipeg, Canada. In between tracks, you'd swear you could hear the ghosts of Scottish and Métis fiddles joining in." Nash from the UK emailed: "Hey Marc, Tried to confirm my subscription and although I am taken to the “thanks for subscribing” page, I still have not had the sign up email / zip for the albums. Waited a few hours, put your address in the contacts, but no joy yet. Maybe there are some leprechauns at work....? Nice podcast – just a suggestion. Could you put the tracklist / artist in the show notes? It’s great that you play a few songs back to back to not interrupt them, but by the time you then announce the artist / track name, I sometimes struggle to match them up." Hey Nash, thanks so much for writing. If you signed up to the email list and did NOT get an email back, I'd suggest you check your spam folder or trash. I don't know what those leprechauns are up to, but they can be troublesome with email. One more suggestion for everyone who is subscribed, reply to one of the magazine emails. That will hopefully insure that future emails go straight to your inbox and not to your gmail promotions or anything like that. Jim & Judy Wolfe emailed about the Flute/Whistle special idea: "Hey Marc, been listening for many years and one band I discovered on the podcast that fits the bill is Flook. Sarah Allen’s flute, and Brian Finnegan’s whistle are great examples for you to consider. Keep up the good work." A few episodes back, I suggested a flute/whistle episode might be in order. So I decided to set that up as our new Patreon Milestone. We are thirty dollars away from a 2-hour Celtic Flute & Whistle special. Chrissy Willow emailed: "Hey, Marc! I followed your podcasts years ago until Google Listen was retired and lost track of you. I'm so glad to see your podcasts on Google Play and have begun following again! The reason I write is because I'm trying to locate a song you played years ago. It was a ballad of a woman who walks the strand and calls up storms to dash the sailors' ships on the rocks. I've searched all over the place but can't find it, and can't remember enough of the lyrics to help. Thus, I'm hoping you might remember the song. Thank you so much for bringing such wonderful Irish music to my life. Have a lovely Saint Patrick's Day!"